What is that eerie and looming creature over there? Is the Demogorgon or Shadow Monster from "Stranger Things?" A meta-human from "The Flash?" The The Loch Ness Monster, perhaps? Some might call it even worse. It's the Cup Monster!! 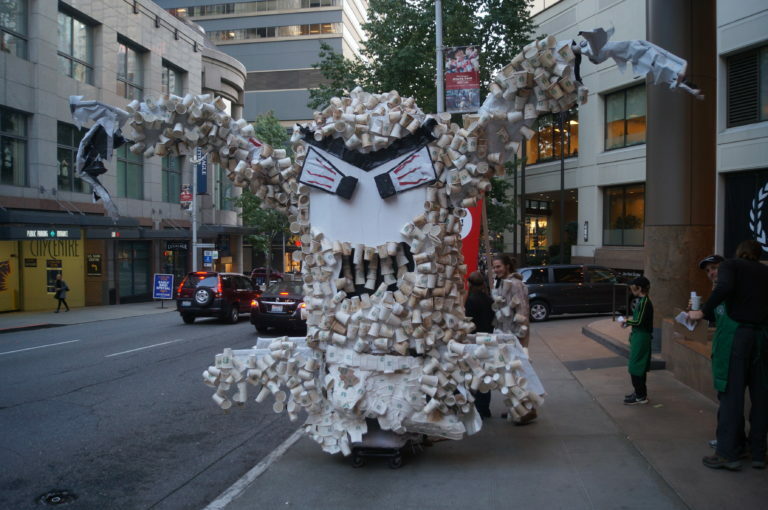 In October, Starbucks CEO Kevin Johnson (as he was kicking off the 2017 GeekWire Summit in Seattle) was greeted with "Grounds"... the "Cup Monster" pictured above. Created by the Bellingham, Washington group stand.earth, Grounds was meant to be a major statement in his looming and eerie-ness. Made of 500 used Starbucks coffee cups and sporting bloodshot eyes, Grounds was meant to pressure Starbucks to move to "100 percent recycled or tree-free cups." This campaign (also known as the "Better Cup" campaign) stems from the 2008 Starbucks promise that by 2015 it would go to 100% recyclables or even reusable mugs. But here in 2017, we're not there yet. In fact, The Better Cup Campaign claims that 1.5 million trees (in the form of 8000+ cups) are still being sacrificed and trashed for cups. The added problem is the plastic coating on the inside of the cup, which helps keep that coffee nice and piping hot, but makes it less likely to be recyclable in some areas. If this is a campaign you support, you can show that by going to the Better Cup website and sign the petition to Starbucks CEO Kevin Johnson.